Hey guys. I hope you are well. The weather has taken a turn this week and it's feeling more autumnal but I have some brights ans holo on the blog today...because that's how I roll! 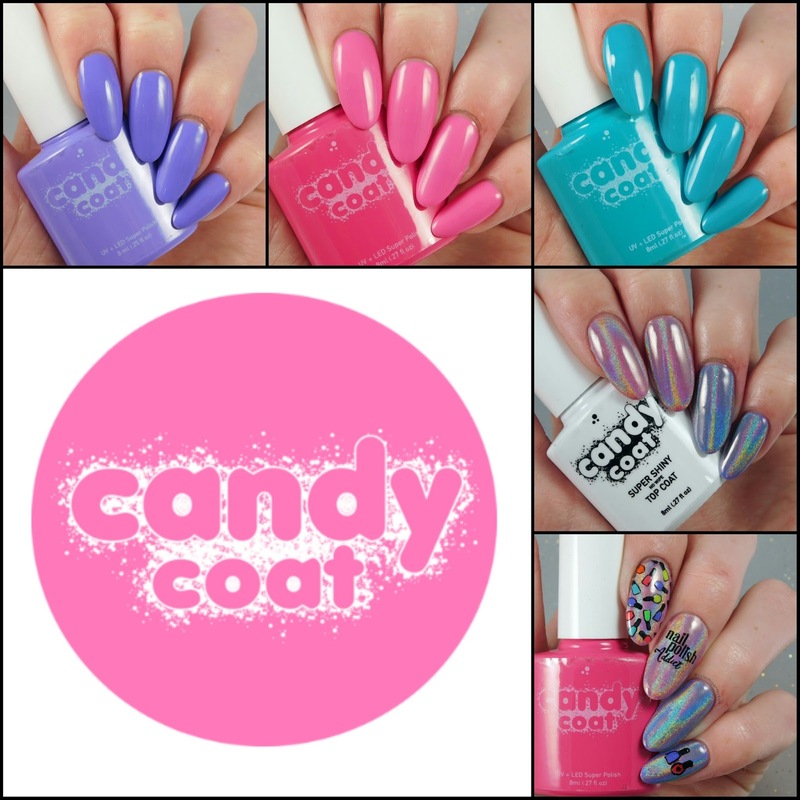 Candy Coat are a fun online gel polish company that specialise in gorgeous bright candy coloured gel polish, hence the name. They have over 320 colours available and offer a few different buying options. They have Pick 'n' Mix, Colour box and Subscription box. For my review I chose 3 colours from the Pink 'n' Mix menu and they also included a base coat, a top coat and a super shiny no wipe top coat. Firstly...how cute is this packaging?! Beautifully presented and even with a little chocolate treat. To apply Candy Coat gel polishes you need to clean your nails to make sure there is no oil left on them with a cleanser. Then dehydrate your nail bed, air dry, and apply your base coat. Each layer needs to be cured for 30 seconds in an LED lamp. Once you have applied your base you can move on to the colour coats, curing in between each one. Then finish with top coat and once cured, wipe the tacky layer off. 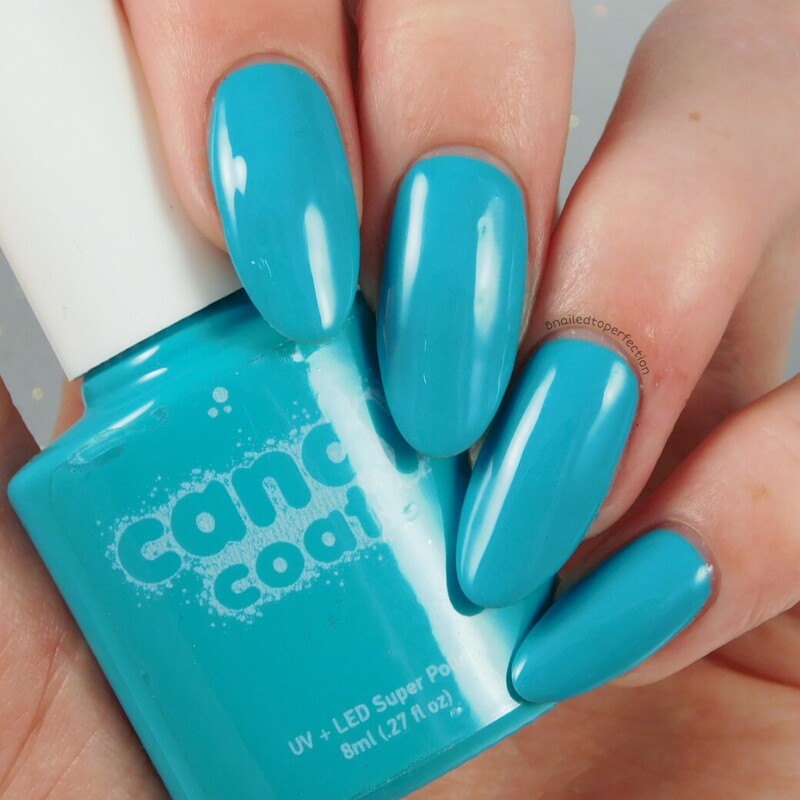 If you use the no wipe top coat you can skip this last step. So the first colour I swatched just had to be this beautiful cerulean blue. Great application and was opaque 2 coats which is exactly what you want from a gel polish. Top coated with the normal Candy Coat top coat. Next up is this lovely hot pink. My camera has toned this down loads as it's much brighter in person. 2 coats and Candy Coat top coat. Last but not least is this ultramarine purple. This is also 2 coats and Candy Coat top coat. The picture above is 12 days of wear. I could have taken it longer but I was going to Pro Beauty and didn't fancy going with grown out gel polish! As you can see the shine has dulled slightly if you compare it to my swatch further up. After about a week I got the chips on my pointed and middle nails but that was it. The chips were so tiny and it didn't affect the rest of the polish at all. Here's a more close up shot. I wasn't overly keen on the removal as it's the type of gel polish that you have to gently scrape off with an orange wood stick. I prefer my gel polish to just flake off after 10 minutes rather than having to push it off the nail. 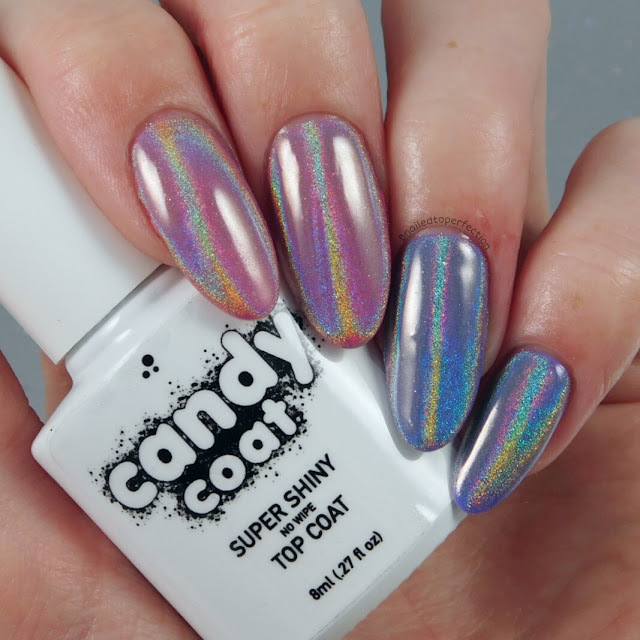 Candy Coat also sent me their Super Shiny no wipe top coat! 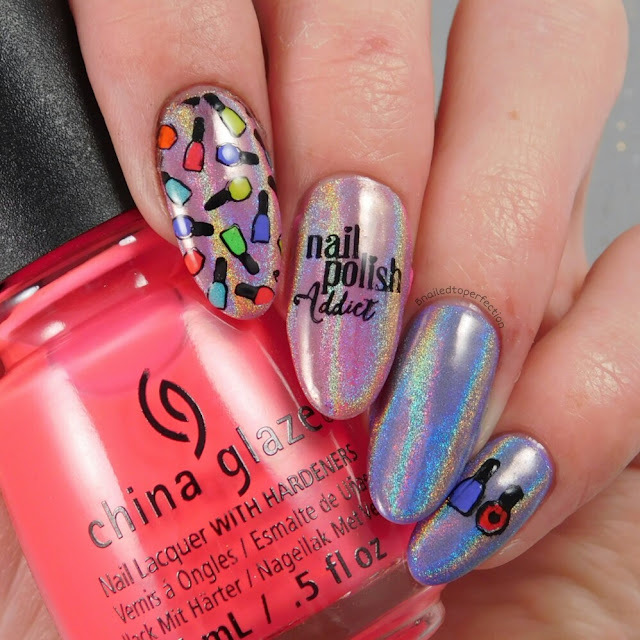 Holograhpic and chrome powders are everywhere right now and they are best applied over a no wipe top coat. I can confirm that Candy Coat's no wipe top coat works, as you can see! Look at that holo! I got my holo from Nail-Artisan-aholics. I added some stamping and decals over the top of the holo. Images are from Uber Chic 7-03. I used various China Glaze nail polishes to fill in the little bottles. These are the nails I wore for Pro Beauty which I will post about soon. 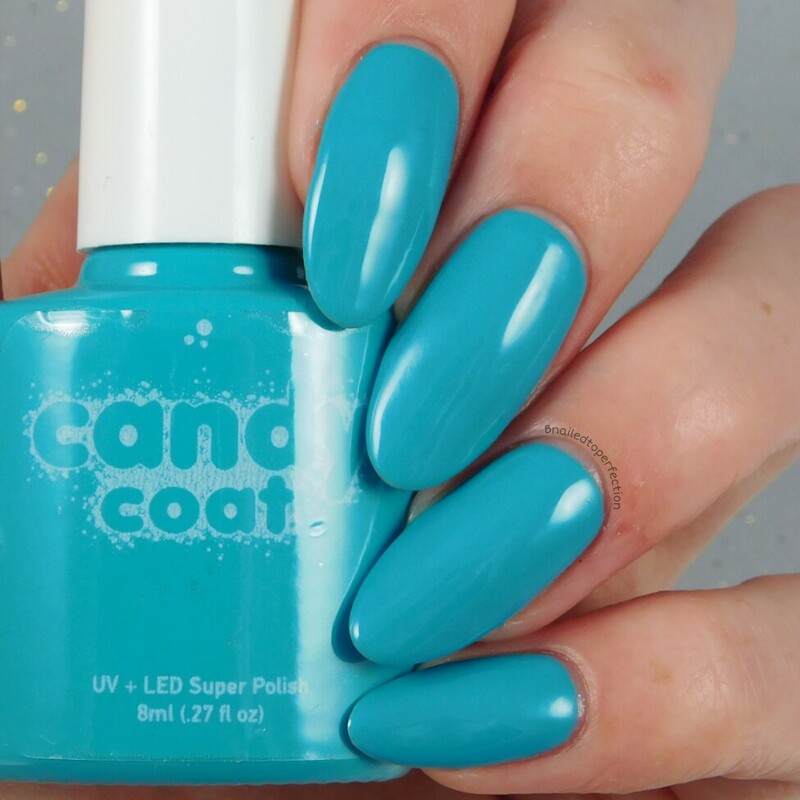 My impressions of Candy Coat gel polish are really good! They have a great formula and application is so easy as the polish just glides on. I definitely think it would last longer than 2 weeks, I just can't wear polish for that long anymore lol. Their colours are so nice and bright but there are other more neutral colours so there's something to suit everyone. The bottles are 8ml and only coat £6 which is great value. I also love how the bottles are the same colour as the polishes and it's a pretty good colour match! The only thing I didn't like was the removal but that's just personal preference I think. Don't forget to check out Candy Coat on their social medias below! Which colour did you like the best? 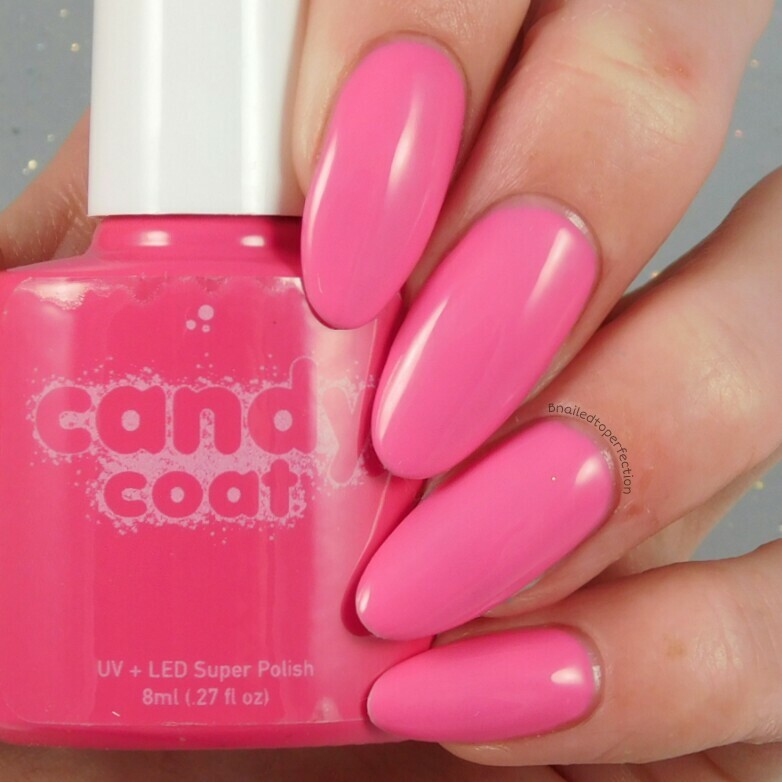 Have you used Candy Coat gel polish before?